Previously I’ve taken Play the Past’s readers through an overview of Operation LAPIS and an in-depth look at the collaborative immersion element that lies at the heart of practomimetic instruction as our UConn team designs it. This week I’m going to walk you through another key component of Operation LAPIS: the Carta Collectonis (collection sheet). Link's gear is about to become blue! Love it or hate it, the “grind” is ingrained in the RPG (and now MMO) genre — and has been for a very long time. 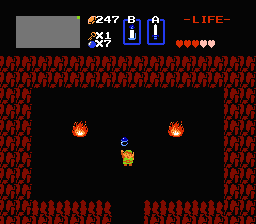 My earliest recollection of willingly committing myself to a grind was collecting 255 rupees in The Legend of Zelda in order to purchase the Blue Ring. This item, as I’m sure you’ll recall, reduced incoming damage by ½. Knowing how difficult the dungeons were going to become, having that buff against damage was vital to my success at achieving the victory conditions in the game. Not long after Zelda, my next most vivid recollection of a grind came about six hours into the original Final Fantasy. When you reach the elf kingdom, there is a very powerful item for sale (the silver sword – 4000 coins). Now, the problem here is that a purse containing 4000 coins is unheard of at this stage in the game. The solution? A clearing to the east of the town that spawns ogres, who, for whatever reason, carry around quite a large amount of money. They are also very difficult to defeat and they have an added bonus of rollin’ with giant scorpions that poison you (and thus require expensive antidote potions to cure). So as an eager 7 year old, I sat down and decided that I was going to spend the four or so hours that it would take grinding ogres in order to purchase the silver sword. Having reached 4000 coins, I bought my fighter the sword and continued on my main quest of slaying the Earth Lich. So what does this have to do with Operation LAPIS? We’ve devised a mechanic that draws heavily upon the grind in video games — namely the need to put in the time and effort in order to gain abilities, gear, or knowledge that will help achieve victory conditions at a later point. This mechanic is called the Carta Collectonis (Collection Sheet), and by virtue of it, students collect words from the texts they see, according to the rules of the Latin language (see what we did there?). Operatives can ‘claim’ any word that they encounter and put it in the appropriate list in their operative dossier (see below). This activity serves three very important functions. First, the students are collecting and organizing words in their various forms, something vital for Latin instruction where the endings of nouns, for example, change based on how the word is being used in the sentence. By using the mechanic enough, the students are naturally attuning themselves to recognize and recall that nouns that end in ‘m’ are very often the direct object. The same learning dynamic attunes them to other features of the language, like verb forms, adjective forms, and even the dreaded subjunctive. Second, each entry also requires the operative to write the definition of the word and thus to build an old fashioned vocabulary list. The repetition and ease of access to a list that they’ve constructed (not one generated for them by some authority) helps them retain more vocabulary important to them and thus take a greater degree of ownership over the material. Lastly, the Demiurge also requires the operatives to include a reference to the source of their collected word. This element acts as a way to place the word in content based on the episode or key-text from which it came. While not as strong as the other two parts of the activity, the context citation helps with the recollection of the word when it is encountered again later on in their mission. So now the question remains: where’s the incentive to take part in this grind? 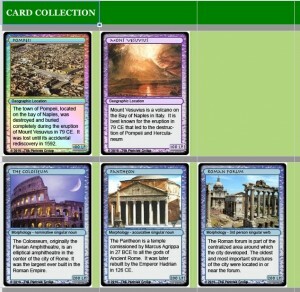 This is, I personally think, part of the genius of the collection mechanic as we’ve designed it. For a lot of students, who have taken Latin courses over the years, the incentive to build out lists that may look similar to the one referenced above was to get better grades on a quiz or a test. Build a vocabulary list, memorize the words on the list, regurgitate the words on a vocabulary quiz and bounce off happily with the A. However, as anyone in education will attest, ‘learning’ something for the sake of a quiz or a test isn’t actually learning. At best, the result is that the information gets stored in the short-term memory banks and dissipates rather quickly. Collect 100 3rd person plural verbs! With the Carta Collectonis we’ve managed to create something entirely different. Drawing heavily upon the “gotta catch ‘em all” mechanic of Pokēmon, we’ve devised a reward system known as CARDs: Classical Attunement Reward Devices. 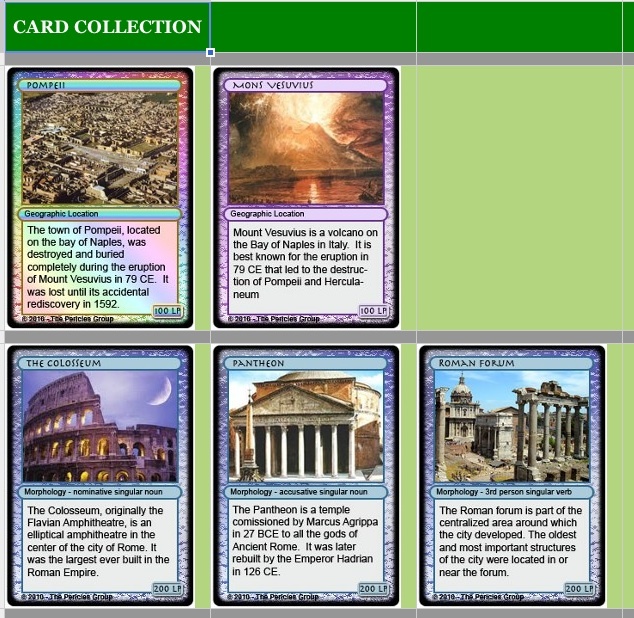 When a certain milestone is hit in a collection category, let’s say 3rd person plural verbs, the operative is rewarded with a CARD like the one to the right. 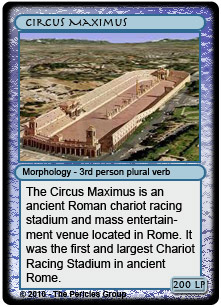 You’ll notice that the CARD looks very similar to a generic CCG card, contains short facts about the object depicted, and has a LP (Latinity Point – the basis of their grades) value assigned to it. It is precisely the LP value that serves as the driving mechanism for the success of the grind activity. Since the LP system is an aggregate system (the benefits of which I hope Roger Travis will explore in a future post), the operatives can use this grind as an alternate way to advance through the course and subsequently advance their grade. A cautious observer might wonder, “Well, isn’t that just gaming the system if the student can gain nearly unlimited bonus Latinity Points through this mechanic?” My reply would be that sentiment is essentially true. However, by doing the grind, by building their lists, by correctly identifying and recognizing the forms, the student is enhancing skills that directly impact their ability to achieve a large part of the victory conditions for the course: learn to read Latin. In addition to receiving the immediately tangible Latinity Point reward, the operatives also receive those digital CARDs as well. They are prominently displayed in another tab of their operative dossier (pictured to the left) and then the “Pokēmon thing” takes hold — namely, the compulsion to collect all of the CARDs in a set. But it doesn’t end there. Once an operative has collected enough of a single form to gain the CARD, a secondary objective is then unlocked. They can continue collecting more of those forms in order to receive the special foil edition and, of course, another LP reward as well. As an added bonus, we’ve also hidden other CARDs throughout the immersion episodes similar to the way the flags are hidden throughout Assassin’s Creed. For completing certain hidden requirements inside of a mission, the operatives may be rewarded with a CARD for their collection. In the end we’ve managed to take another important mechanic in games, the grind, and leverage its affordances into a mechanic that not only helps the students gain the skills that they need to achieve the same victory conditions for the game and the course (learn to read Latin) but also provide a compelling incentive to do so. Like the end-game raiders that push themselves to attain the best gear through the repetitive grind, the students that actively take part in the Carta Collectonis put themselves in the best position to achieve success in future situations in the course. I already know Latin. Can I come learn it again? This sounds too fun! Um, not wishing to sound negative, but grind is one of the least popular, least motivating things found in games today. It’s a parasite on the RPG genre, kept purely because it is an easy way to pad out the experience. It’s essentially gold stars, but bigger! shinier! golder! stars. Having said that, in this context it’s far more appropriate than in the RPG. It may well prompt you into different modes of thought, eg. ‘I really need to wear down those ablatives*’. If you are thinking strategically at that level, then probably job done. Defeating the word/monsters isn’t the point, identifying them is. By the time it becomes boring, you’ll have learned what you need to. Might there be some perverse consequences? Might poor old neuter nouns get overlooked as they’re trickier than straight masculine/feminines? Might they have to be worth more to compensate? Emily: any time. We can Skype you in to the Latin I class, Recentia Tulliana needs a little bit of help in the RP sphere. Cdr Jameson: Thanks for the honest criticism– you are right on it being not necessarily the most fun activity in games but it works. Take Bungie’s latest grind for the armor pieces in Reach as a prime example. There are millions of people playing online matches, possibly in greater frequency than they otherwise would be, in order to unlock those parts. In the end, because by the nature of playing that many games, you are going to be a better Halo player because of it. I know that if I had to the time to take part in that grind, I certainly would be a lot better of a Halo player than I actually am. As far as certain elements being neglected in what we’ve constructed for LAPIS, you answered that right in the paragraph above. Is the class weak on recognizing those darn nominative and accusative plural neuters with their dastardly short a? Find a narrative reason to focus the collection on those particular forms — I did something along those lines just this week for 1st person plural verbs. Weighting the LP awards is an justifiable solution as well. It’s something that we’ve discussed but for this first run, we just set all of the elements to a static reward. One thing I always say to my practomimetic classes is “My methods put you in serious danger of having fun, but if you have fun, it’s not my fault.” To turn it around, the grind may not be fun according to standard definitions of “fun”–but our team has made very good use of how compelling it is. Bards ground warriors to get through a long feast, as the Achaeans killed Trojan after Trojan, and vice versa. WoW’ers grind rep to get to an instance. And our students grind forms to get points and CARDs. In fact, if the grind isn’t fun, doesn’t that have to mean that it’s that much more compelling? I’m curious. Noticed Oper. Lapis in the program for the ACL summer institute. Hopefully I’ll be able to go to that. If not, is this something your students are doing? Can other students participate? I teach Latin, and am curious about our students participating. Matt — both of my Latin I sections are currently involved in Operation LAPIS with fantastic results. We’re also using this at three other high schools in Connecticut and at the University of Connecticut. Right now I’m running a small (and very loose) demo of a full mission with a group of educators from all over the Northeast; if you are interested, we can definitely grant you access. Next year it looks very likely that we’ll be offering Operation LAPIS (Part I) “as-is” for those who are seriously interested it giving it a full try with their classes. I’m interested in checking this out for future Latin classes, but I can’t seem to find any actual connection to access the program, or any pricing structure listed anywhere. Will it be available to teachers next year? And what is a ballpark pricing estimate? Hi Cherie, thanks for the interest in Operation LAPIS — there is more information available at http://www.practomime.com . We will have it available for next fall at a targeted price of $10/student for the school year. Feel free to send me an email and we can discuss this further.